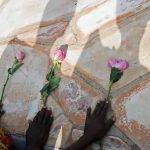 Rwanda known to the many as the land of a thousand hills is a home to the endangered mountain gorillas. 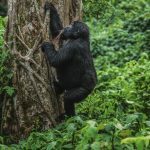 Inhabiting the remote forested mountains in volcanoes national park situated in north western Rwanda, mountain gorillas are some of the closest wild human beings relatives. Volcanoes national park is a home to half of the mountain gorilla population in the Virunga massif with a total of 10 habituated mountain gorilla families that are open to tourist visitation. 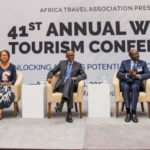 On a single day – all year round , tourists heading for a gorilla safari in Rwanda first gather at volcanoes national park headquarters in Kinigi where they are briefed, allocated to the mountain gorilla family they will be tracking and to the guide who will be leading them in this great wildlife expedition. Tracking gorillas starts in the morning and ranges from 1 to 8 hours of hiking depending on the movement of the gorillas and the luck of the tourists. 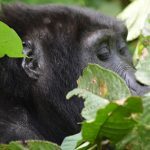 Each of the mountain gorilla family is tracked by strictly a group of 8 tourists in a day which means 88 mountain gorilla tracking permits are available every day. 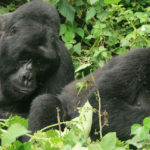 Currently, Rwanda is the number one and most preferred mountain gorilla-tracking destination. Always follow the guide’s instruction because the guides navigate the national park every day and therefore are aware and understand every part of the forest. b) Always keep in the tourist tracking groups especially while in the forest to avoid getting lost. 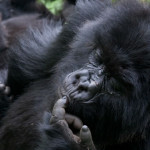 c) Avoid making a lot of noise as it can distract the mountain gorilla and other wildlife species in the forest. d) Avoid littering any rubbish in the national park. e) Do not go for tracking when sick. Always keeping a reasonable distance away from the mountain gorillas at least 7 meters. b) Not using flash photography while taking photos of the mountain gorillas as it may irritate them. c) Minimizing noise until you are at least about 200 meters from the gorillas. d) Avoid eating in the presence of the mountain gorillas. e) Do not touch the mountain gorillas. When they come towards your way, just remain where you are and avoid a direct eye contact with the gorillas. 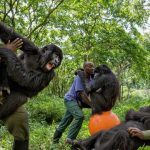 f) Do not imitate the mountain gorilla behavior like beating the chest because it might send the wrong message to the mountain gorillas. Tourists are allowed to be in the presence of the mountain gorillas for strictly one hour, which is intended to minimize chances of disease, spread from the human’s to mountain gorillas. There are high chances of disease spread from humans to the gorillas because about 98%of their DNA is similar to humans. If the above are observed and well followed by tourists, they can enjoy exclusive and once in a lifetime experiences. Tourist heading for tracking should carry enough drinking water because the hike through the forest is a little strenuous causing a lot of sweat and it is therefore wise to keep hydrating (drinking water). 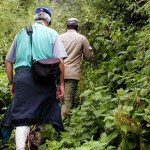 Tourists are also recommended to wear long sleeved shirts and long pants because mountain gorilla tracking is done in the forest with a lot of plant vegetation some of which cause skin irritation when in contact. Carrying a raincoat or water proof pant can never be a bad idea because rainfall in volcanoes national park Is highly unpredictable and can therefore occur at any time of the day.